World Land Trust (WLT) is supporting a ranger in Yanacocha Reserve, which is owned and managed by WLT’s partner, Fundación Jocotoco. Silvio Calderón is WLT’s Keeper of the Wild in Yanacocha, a reserve situated on the slopes of the active Pichincha volcano, which overlooks the Ecuadorian capital of Quito. Silvio is one of two rangers at Yanacocha, and funding for his post has been made possible by donations in memory of Katrina Jacks. He has been a ranger at Yanacocha for more than seven years and he is familiar with all aspects of the reserve. He lives in the nearby Community of Yanacocha and is an excellent local ambassador for nature conservation. 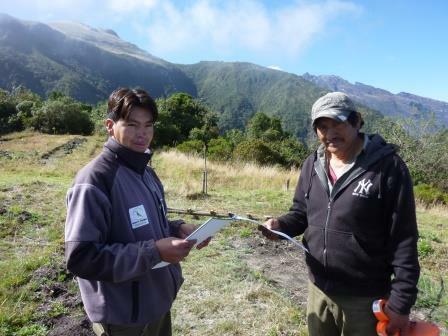 On a day to day basis, Silvio is involved in Yanacocha’s forest conservation project (also funded by WLT). He works in the native species tree nursery, and helps with the tree planting at higher altitudes in the reserve to restore the cloud forest habitat in areas that were previously cleared for pasture. Recently, Silvio has put up information panels in the reforested area. The panels explain forest conservation and its benefits for wildlife, and describe some of the species in the reserve. Silvio has also been busy cleaning and repainting signs at the entrance to the reserve. Donations in memory of Katrina Jacks are also funding an interpretation centre at Yanacocha. Before building work commenced Silvio helped to move the plants and the greenhouse that were in the way of the site. Construction on the centre started in March 2014, after the rainy season. Yanacocha is an Important Bird and Biodiversity Area and Silvio is involved with the ecotourism aspects of the reserve. Along with Luis Hipo, the other ranger at Yanacocha, he patrols the reserve, maintains almost two miles of designated trails, and keeps topped up the hummingbird feeders positioned at key spots along the paths. He also guides visitors to the best bird watching sights, and every month he monitors the bird species of the reserve. Silvio accompanied a group of WLT representatives on a tour of the reserve in 2013. Among the group were Nigel Simpson, a Trustee of both WLT and Fundación Jocotoco, Alan Martin, WLT Council member, and Renton Righelato, former Chairman of WLT Trustees. With help from Silvio, members of the party were able to see a range of birds including Scarlet-bellied Mountain Tanager, Ocellated Tapaculo and Tawny Antpitta. Yanacocha Reserve was established in 2001 to protect an important forest site for the Black-breasted Puffleg, a hummingbird listed as Critically Endangered on the IUCN Red List and adopted as the emblematic bird of Quito in 2006. Yanacocha’s Polylepis forest has been a source of water for ancient Quito since pre-Inca times, and today still supplies of about 20 per cent of the water for Quito. Please support Silvio, Keeper of the Wild at Yanacocha Reserve. © Francisco Sornoza. WLT is raising funds through the Keepers of the Wild appeal to support more rangers, who work hard to protect some of the most threatened habitats and wildlife on Earth.